Taro is a common name for a wide range of plants under the family Araceae. There are many species of plants that are hosts to the name, and there are plenty of species within the family that are edible. The most commonly used species for consumption is the Colocasia esculenta. The leaves, stems and roots of taro are a staple crop in many regions worldwide, especially Asia. Taro leaves are indeed considered "Toxic" when uncooked. This is due to crystal compounds that occur naturally in the leaves and stems of taro. These crystals are shaped like small needles and are highly irritating. Consumption of raw taro is a mistake that one will make only once. I have made the mistake myself, upon eating about half of a taro leaf I experienced an itch in my mouth that lead to an extremely painful swelling in my esophagus. Cooking of the taro will reduce the crystal chemicals to a safe level and improve the taste and texture of the plant. Taro is popular in many dishes worldwide; It is commonly prepared in stews and stir-fries. Due to the crystal compounds, leaves (which have a high concentration of these) are considered a "last-resort" food in many regions and is only consumed if there is a food shortage. Strictly ornamental varieties of Elephant Ear exist under the Caladium genus with brightly colored, usually pink, leaves. 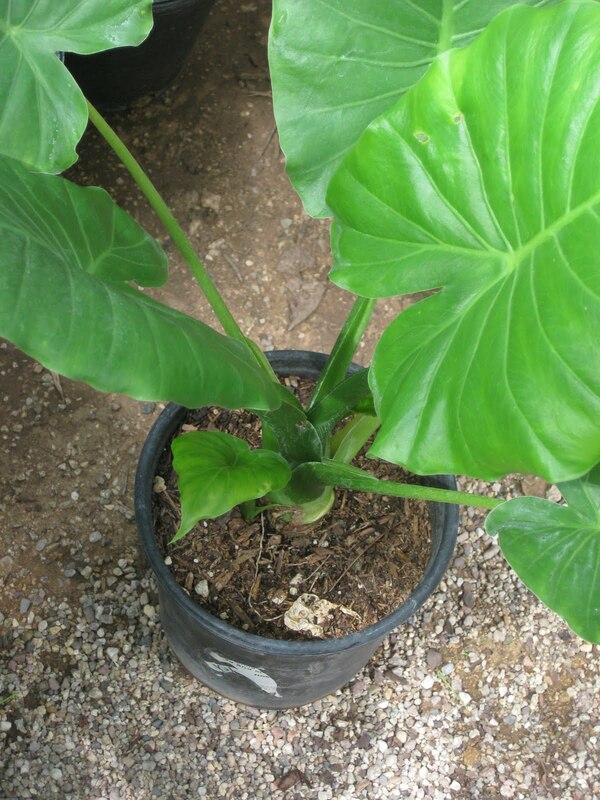 Many species from the Colocasia and Xanthosoma genera are also popular ornamental plants. Variations occur on many of these ornamental species, such as especially elongated leaves. Many include variegations exhibiting beautiful stripes and splashes of color. 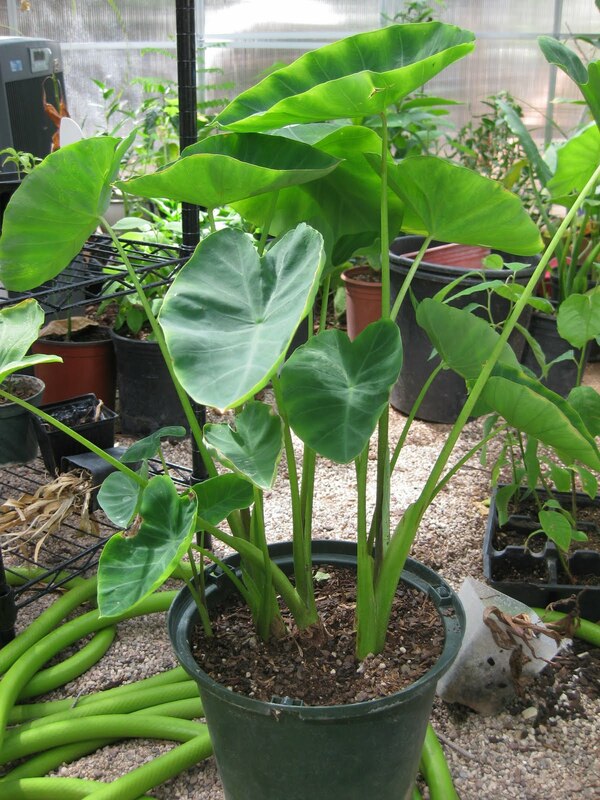 Most Taro/Elephant Ear plants are considered tropical, thus they are sensitive to frost. The majority of these plants need to be grown in zones 10-11 with warm temperatures and a moist climate. 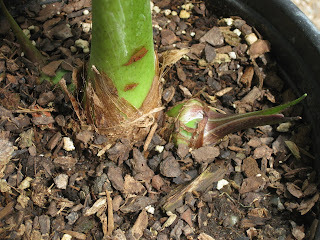 There are some ornamental elephant ears that are exceptions and can easily grow in lower zones. Wherever taro is being cultivated, the soil must be light and moisture retentive. At the same time the soil should be well draining as to not waterlog the tubers. If you live in an area with unsuitable conditions for taro, you can always grow it indoors or in a greenhouse. These plants are easily cultivated by tubers, thick potato-like roots. First you must obtain some of these tubers which can sometimes be found in grocery stores. Depending on the species of Taro these tubers will look very different. Some will be smooth and round, others will be rough with root-like fibers. 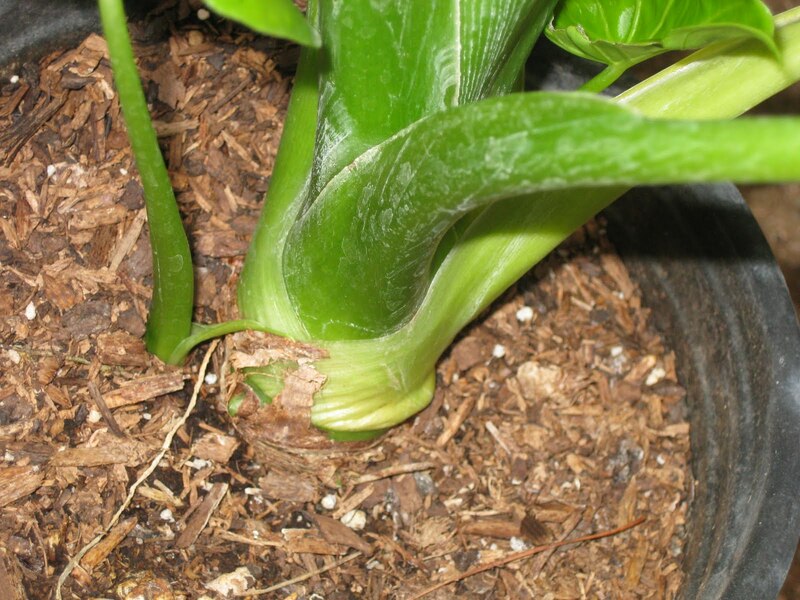 Growing this plant is as simple as placing the tuber in fertile soil and adding water. You can even cut the tuber into sections to multiply your crop. Within the first week of planting the tubers you should notice a small green stem poking through the soil, this will be the first leaf. Over time the plant will develop into a thick bush and grow to a height of a foot to more than 6 feet (depending on the species). As the plant develops it will send off more shoots, leaves, and tubers allowing you to gradually harvest without harming the plant. Industrial fertilizers should not be necessary for growing Taro, instead apply rich manures or compost to the top soil. If all goes well Taro can be harvested in less than a year. This is one of my elephant ears of an unknown species/genus. It is different from the rest of my taro plants in that it's leaves are shiny and feel like plastic. Here you can see the base of the same taro plant. Each stems comes from a single larger stem that keeps sending off shoots. A baby shoot can be seen in the left of the picture. These usually come up straight from the tuber below the soil. Here is another one of my taro plants of a different species. You can clearly see the difference in growth habits. This plant is also growing from a single base stem but is much taller. This is the base of the last taro plant. You can see more shoots growing from the base of the main stem. This is common in taro plants and contributes to the thick growth habits. 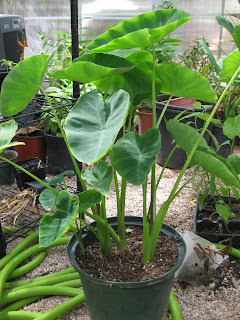 A more developed Taro plant exhibits what looks like many different plants in the same container. This is because as the plant grows, it sends off new tubers (just like a potato), each of the tubers then has the potential to send off more shoots. 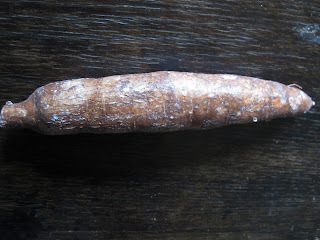 This is a cassava tuber that I purchased at a local special foods grocery store. It was mislabeled as "giant taro root" without a species or genus. This is sometimes the case when buying imported agricultural products, but it certainly makes for a good surprise! The last picture you said "giant taro root" is a Cassava (Manihot esculenta), also called yuca, mogo, or manioc. I grow up in the tropics and we have not propagated it from tubers. The stems are what we use for propagation. Did this Giant Taro turn into anything for you? I am curios. Very nice blog, btw. Love it. It appears that the grocery store had mislabeled it, thank you for your correction! Unfortunately the tuber rotted, but now I am encouraged to go back and get some Cassava stems. Thanks for the input. thanks for this information. I have just started growing Taro and it's really easy. It's already near 15cm after only 2 weeks. And what's interesting, every morning there is a dew drop on top of the leaf! As if it's attracting water from the environment somehow. and indeed, the "Cassava tuber" is a Yuca. thanks and aloha from Switzerland! Here in Mauritius we call taro 'bredsonz' and the dew drop on the leaf gives the saying, 'dilo lor bredsonz', literally, 'water on taro leaves'. We use it to say that someone is completely imperbeable, impassive to remarks or critics. Very nice blog. Just thought that you may want to make some corrections under "toxicity." Taro "root" is not toxic uncooked; however, it is always cooked. it's the "leaves" are toxic when uncooked. Taro root is by no means a "last-resort" food. It is cultivated for food in the tropical regions of the world and much enjoyed for its starchy and nutty flavor. It is the leaves that is not widely eaten, but still enjoyed after soaking overnight and cooked. Based on your definition, you can also call tomato as toxic because the leaves of the tomato plant are definitely toxic and not editable, even when cooked. I am not sure of the technical definitions, but Taro roots definitely do have the same effect as the leaves. Even if they are cooked but too briefly they will still make your throat itchy. They are even difficult to handle because any contact with the sap will make your hands itch. The author didn't say that taro root was a last resort food, he said "Due to the crystal compounds, leaves are considered a "last-resort" food in many regions"
Thank you for this information.I have just started growing Taro.Here in Papua New Guinea it is a staple crop . 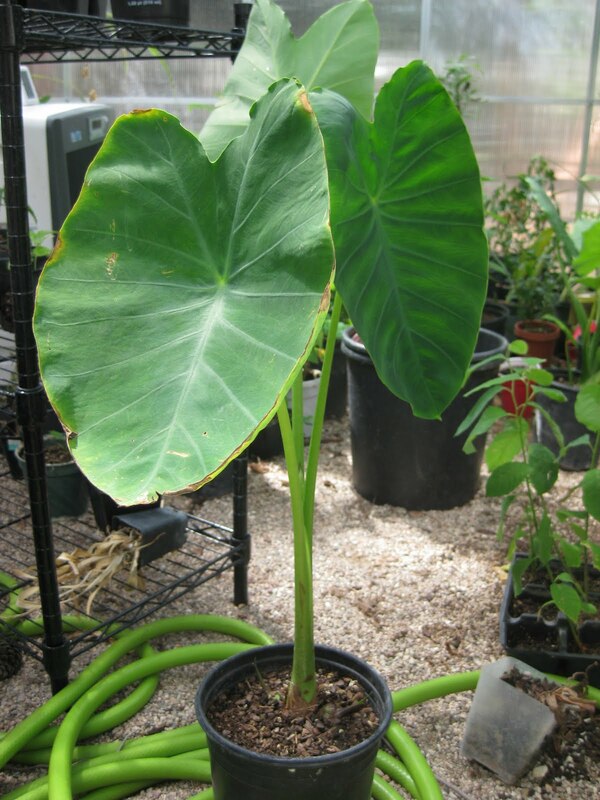 I Live in LA and have seen Taro growing at the zoo so I know it can handle the heat here , but Im interested if anyone knows does it need to be grown under the shade of other trees ? In the zoo its either grown beside a water feature so plenty of humidity or in shady areas of tall established trees . I say just go for it....I just bought some tubers at a Asian market close to my house for a couple dollars and stuck them in some dirt.....they have sprouted in a pot and doing well after 2 weeks in Minnesota.......just try it! I am curious, if there is a way by your advice in improving growth for taro in our low lying islands...?? Taro is a crop of prime economic importance,used as a major food in the Pacific Islands Countries.In PNG taro is consumed by the majority of people whose livelihood is mainly depend on subsistence agriculture. I enjoyed this article on the Taro plant. I have admired them and didn't know they were edible plants since here in Louisiana a gulf coast state they are ornamentals. I had a man from an Kenya tell me that the tubors were edible to my surprise. Are the tubors cooked like potatoes? Yes these tubers cooked like potato but has a nice ordure and contain a lot of starch. Every part of the taro plant is toxic and edible if properly cooked. Never eaten raw or half cooked. This is a no, no. Using taro leaves as vegetable in the Pacific Region is not considered a last resort. Whatever dish prepared with taro leaves are considered delicacies due to it's detailed and time consuming preparations. Palusami for the Samoan and Lupulu for the Tongans, similarly with Fijians and Papua NQ, are examples of the delightful taro leaf treats, cooked in coconut milk, on any dinner table. At what point in the taro's growth cycle do you harvest the tubers for food or for further propagation? As per my dad, some taro species take at least 9 months to mature for harvesting, some closer to 12 months. One way to tell if they're ready for food is when the leaves wither or fail (turn yellow) quickly. Another is when the bulbs poke their heads above ground. Regarding the length of time, it also depends on where they're planted, whether in swampy ground or dryer with good irrigation. If they're ready for food harvest, then you can cut them up and plant the pieces for further propagation. They do take root. I've tried that method and gotten new plants that way. Taro is called cocoyam in Ghana. the leaves are known as kontonmire and are enjoyed in spicy sauces made with palm oil and dried fish. Not only is it delicious, it also gives you a lot of iron and helps digestion. The roots have a mild creamy taste that I love. Thanks for the informative post, I have a few small tubers in my kitchen, will go out and plant them in the garden tomorrow. We grew taro very successfully in zone 7 in southeastern Oklahoma. Never watered it, and of course there is very little rain in the summer. The plants grew to an incredible size and each plant produced something like 10-15 pounds of tubers. We had a sandy soil there. The variety we grew had many small tubers, unlike the seemingly more common types with one large tuber per stalk. In Guatemala where we live now, the plants grow year-round of course, the soil is a heavy clay, and the plants also seem to do well.